I’m a firm believer that 360-degree videos created for VR are going to be a big part of the future of social media. About 18 months ago, I bought an Insta360 camera that gave me an opportunity to create 360-degree photos and videos. At the current price of under $100, the product does offer a lot, but there are still areas to improve on. In this vlog I share my 2 cents on this product as a whole. MY SISTER IS A PUBLISHED AUTHOR!!! MY SISTER IS A PUBLISHED AUTHOR!!!!!!!! To say that my sister, Becky, and I are close might be the understatement of the year. It’s hard to begin to describe the depth of our sibling relationship. The reality of the depth comes from the valleys that we’ve been through together. We endured broken relationships, painful losses, school challenges, and constant change. We navigated some hilarious phases like Jinco jeans (her) and Nike earrings (me). We journeyed through her countless surgeries that seemed to never end and both helped each other move more times than we could count. We even got arrested together (another story for another time)! We had some great times along the way as well! Coolio, Montell Jordan and Garth Brooks on full blast in my high school 85 Blazer. Graduating college (eventually) and finding spouses better than we deserve! We are both blessed to have incredible happy and healthy daughters. We have sure been through it all! Throughout my life, my sister has always had my back and I’ve had hers. I will never forget that first year of following Jesus and praying so hard for her. I wasn’t always the best model of Jesus to her, but I wanted more than anything for her to find the same joy that I had. And she found Him and hasn’t stopped running hard and fast after Jesus ever since! It has been such a blessing to watch her grow in her faith throughout the years. To watch her impact so many lives through her ministry whether through Phi Lamb, youth ministry, women’s retreats, prison ministry and probably most significantly, through her writing. God has given her a passion for the written word and gifted her so uniquely to ministry through those words. Since she first became a Christian in high school she has consistently communicated her desire to write Bible studies like Beth Moore. I believe much of this came out of how impacted she was by these studies and had a deep desire to have a similar impact on so many others like her that needed these words spoken over them. She has been persistent in this desire/calling/passion even to the point of praying specifically for the opportunity to publish a book with Lifeway/B&H. To be totally honest, I wasn’t always the biggest encourager here. You see, Becky has a gene that runs strong in our family to hustle. She didn’t wait for a publishing contract to begin writing Bible studies and publishing resources to minister to women. She published a youth Bible study years ago that I shared with teenage girls in my youth group and over the past few years has been self publishing advent and lent Bible studies that thousands of people from all over the country (including hundreds of women in prisons) have been reading and being ministered to through the writing. I didn’t believe that she needed a publisher, but I believed that her heart’s desire was for greater impact. I agreed that this partnership would produce even greater fruit than she could have ever done on her own. And greater impact has been Becky’s heart desire from day 1. I along with many joined her in that prayer and believed God would answer it. 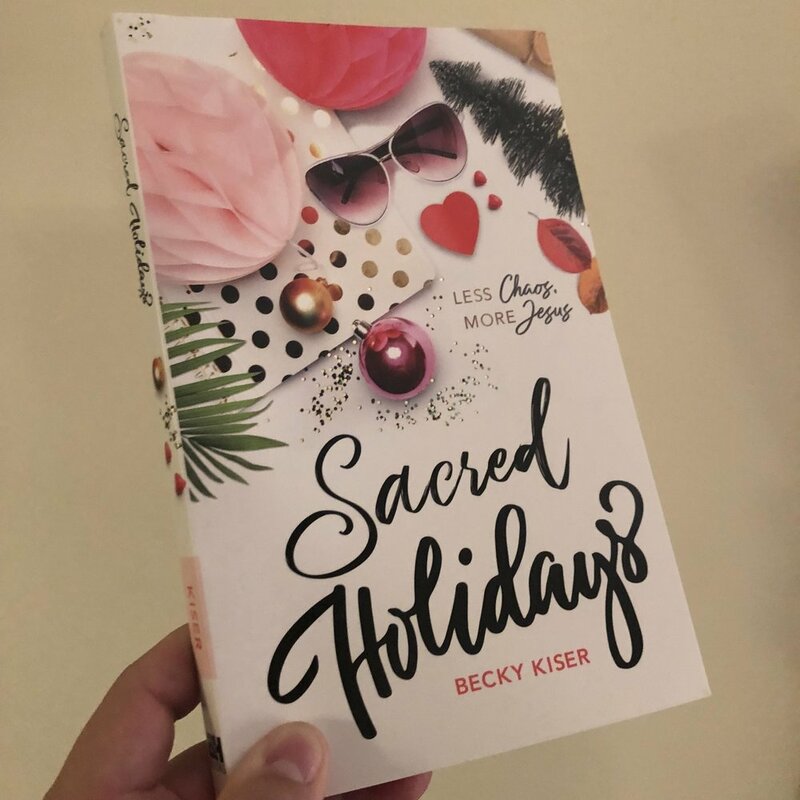 It must have been a year ago that Becky was meeting with agents and going through the process of book proposals and meeting with various publishers still praying that Lifeway/B&H would sign her. I remember when she called to tell me that they (B&H) were interested and she just wanted to guard her heart still. I will always remember when she signed that first contract and having the privilege of a late night writing session together in the corner booth of the Black Walnut in The Woodlands. Becky has prayed diligently and worked incredibly hard for this day to finally be here! Today is the day that she officially becomes a published Lifeway author! And now you get to enjoy the fruits of her labor! As her brother I got an advanced copy and I might be a bit biased, but this book is awesome! So, what you are waiting for? Buy a copy now or 3 or 30! And… after you get your copy, make sure you go back to Amazon and leave a review! I have no doubt it will be 5 stars! Becky, I’m so proud of you! Enjoy this day! You deserve it! I believe this is just the beginning and the best is yet to come! If you have been following me on my vlog, I’ve been posting a lot of content about the Oculus Go since I got it five months ago. While I’ve been celebrating it quite a bit, I want to share the good with the bad. Unfortunately, it broke. As I continue to explore this device, here’s my honest feedback.